Finding derelict spacecraft and space debris in Earth's orbit can be a technological challenge. Detecting these objects in orbit around Earth's moon is even more difficult. Optical telescopes are unable to search for small objects hidden in the bright glare of the moon. However, a new technological application of interplanetary radar pioneered by scientists at NASA's Jet Propulsion Laboratory in Pasadena, California, has successfully located spacecraft orbiting the moon -- one active, and one dormant. This new technique could assist planners of future moon missions. "We have been able to detect NASA's Lunar Reconnaissance Orbiter [LRO] and the Indian Space Research Organization's Chandrayaan-1 spacecraft in lunar orbit with ground-based radar," said Marina Brozovic, a radar scientist at JPL and principal investigator for the test project. "Finding LRO was relatively easy, as we were working with the mission's navigators and had precise orbit data where it was located. Finding India's Chandrayaan-1 required a bit more detective work because the last contact with the spacecraft was in August of 2009." Add to the mix that the Chandrayaan-1 spacecraft is very small, a cube about five feet (1.5 meters) on each side -- about half the size of a smart car. Although the interplanetary radar has been used to observe small asteroids several million miles from Earth, researchers were not certain that an object of this smaller size as far away as the moon could be detected, even with the world's most powerful radars. Chandrayaan-1 proved the perfect target for demonstrating the capability of this technique. While they all use microwaves, not all radar transmitters are created equal. The average police radar gun has an operational range of about one mile, while air traffic control radar goes to about 60 miles. 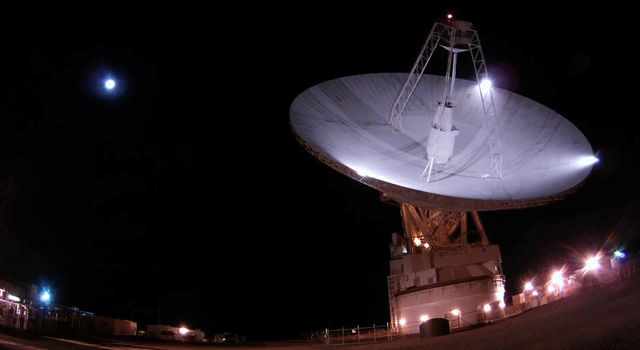 To find a spacecraft 237,000 miles (380,000 kilometers) away, JPL's team used NASA's 70-meter (230-foot) antenna at NASA's Goldstone Deep Space Communications Complex in California to send out a powerful beam of microwaves directed toward the moon. Then the radar echoes bounced back from lunar orbit were received by the 100-meter (330-foot) Green Bank Telescope in West Virginia. Finding a derelict spacecraft at lunar distance that has not been tracked for years is tricky because the moon is riddled with mascons (regions with higher-than-average gravitational pull) that can dramatically affect a spacecraft's orbit over time, and even cause it to have crashed into the moon. JPL's orbital calculations indicated that Chandrayaan-1 is still circling some 124 miles (200 kilometers) above the lunar surface, but it was generally considered "lost." However, with Chandrayaan-1, the radar team utilized the fact that this spacecraft is in polar orbit around the moon, so it would always cross above the lunar poles on each orbit. So, on July 2, 2016, the team pointed Goldstone and Green Bank at a location about 100 miles (160 kilometers) above the moon's north pole and waited to see if the lost spacecraft crossed the radar beam. Chandrayaan-1 was predicted to complete one orbit around the moon every two hours and 8 minutes. 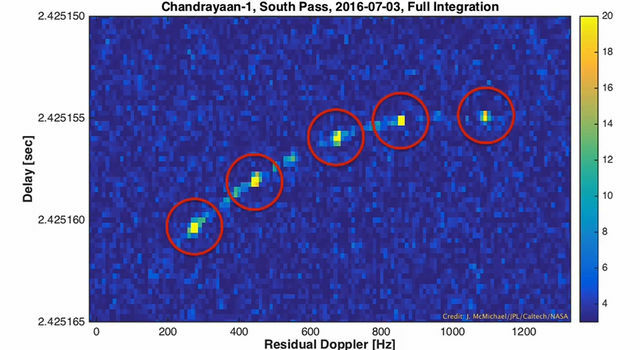 Something that had a radar signature of a small spacecraft did cross the beam twice during four hours of observations, and the timings between detections matched the time it would take Chandrayaan-1 to complete one orbit and return to the same position above the moon's pole. "It turns out that we needed to shift the location of Chandrayaan-1 by about 180 degrees, or half a cycle from the old orbital estimates from 2009," said Ryan Park, the manager of JPL's Solar System Dynamics group, who delivered the new orbit back to the radar team. "But otherwise, Chandrayaan-1's orbit still had the shape and alignment that we expected." Calculations suggest that the spacecraft, "lost" since Aug. 2009, is still circling some 200 km above the lunar surface, but it was generally considered "lost." NASA’s Jet Propulsion Laboratory, using a new interplanetary radar technology, has spotted India's Chandrayaan 1, which has been out of radio contact since August 2009. "We have been able to detect NASA’s Lunar Reconnaissance Orbiter [LRO] and the Indian Space Research Organisation’s Chandrayaan-1 spacecraft in lunar orbit with ground based radar," said Marina Brozovic, a radar scientist at JPL and principal investigator of the test project, in a press note released by JPL on Thursday. "Finding LRO was relatively easy, as we were working with the mission's navigators and had precise orbit data where it was located. Finding Chandrayaan-1 required a bit more detective work because the last contact with the spacecraft was in August 2009." "Although the interplanetary radar has been used to observe small asteroids several million miles from the Earth, researchers were not certain that an object of this smaller size as far away as the moon could be detected, even with the world's most powerful radars," the press note added. Optical telescopes are unable to search for small objects hidden in the bright glare of the moon. Chandrayaan-1, India’s first moon mission, was launched on October 22, 2008. It was successfully placed in a polar orbit around the moon on November 8, 2008. The Moon Impact Probe was placed on the moon on November 14, 2008, and with this India became the fourth country to touch the moon. Analysing the soil collected by the impact probe, Indian scientists found evidence of the existence of water on the moon. The mission was expected to last for two years; however, after 312 days, it had to be closed, as the station lost track of the spacecraft on August 29, 2009. Finding a dormant spacecraft around the moon is difficult, since its orbital path could have varied over time, or even crashed on the moon. 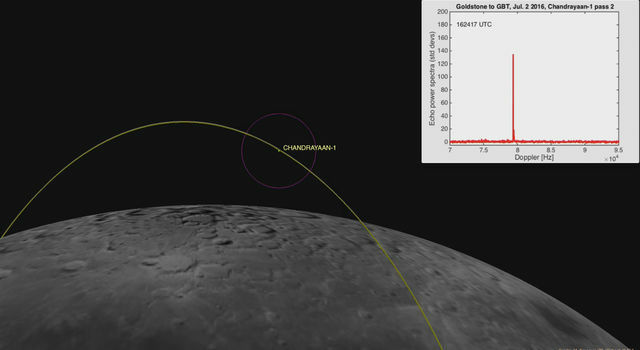 JPL's calculations suggest that Chandrayaan-1 is still circling some 200 km above the lunar surface, but it was generally considered "lost." As Chandrayaan-1 is in a polar orbit around the moon, the scientists aimed the radar at a location above the moon’s north pole and waited for the satellite to pass the radar beam. "Chandrayaan-1 was predicted to complete one orbit around the moon every two hours and 8 minutes. Something that had a radar signature of a small spacecraft did cross the beam twice during four hours of observations, and the timings between detections matched the time it would take Chandrayaan-1 to complete one orbit and return to the same position above the moon’s pole," the press note said. Seven more readings over the next three months confirmed that it is indeed Chandrayaan. India's second moon mission Chandrayaan-2 is expected to be launched at the end of 2018.